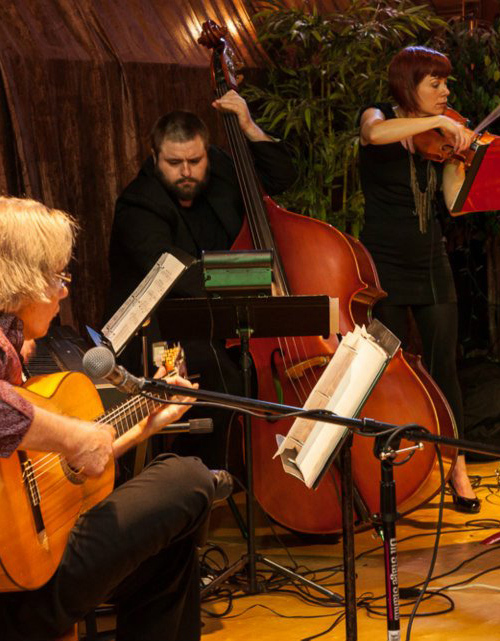 One hundred and twenty years of Argentine Tango, Milonga, and Waltz: this is ROGUE TANGO. Occassionally, Mateo adds cello, piano, bandoneon, or one of three additional violinists to the mix. One only knows for sure that the music will be world-class tango, rich, pure, exciting, and real. Argentine tango, like flamenco, is culturally specific, boasts its own vocabulary, ornamentation, and articulation. All the players remain avid students, as well as aficionados, of this vibrant art form. Mateo has been an active participant in tango for more than ten years, and has recorded 4 CDs and numerous videos of tango of the various eras: Guardia Vieja (Old guard), Edad de Oro (Golden age), Modern, Piazzolla, Post-Piazzolla, and Tango Nuevo (New tango). The creation of Rogue Tango was a labor of love and he continues to find it immensely rewarding. Contact Mateo for specific details, availabilities, and pricing.